Give your classroom effective teaching by the master teachers with ProTeach. 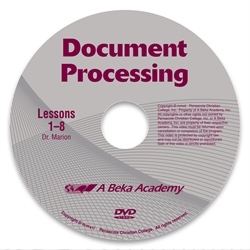 These engaging videos, built on a solid Christian worldview, will guide your high school class in creating memos, letters, and several kinds of employment documents, including a resume, cover letter, and follow-up letter. Whether for a career, a part-time job, or just personal benefit, these high school practical/performing arts elective will teach your students skills that they can use all through life. Some of the skills—creating reports and tables—are immediately applicable in the academic setting. With this monthly rental you will be able to use the DVDs and let our master teachers present your students with the lessons designed to help them succeed and advance in their education. As your students become acquainted with the students on the video, they will feel as though they are a part of the class. The master teacher will even pause to give “students watching” a turn to participate. While enjoying the fun and expanded learning of ProTeach, your students will have the benefit of your guidance in the classroom as you administer quizzes and tests or check their daily work.